Tragedy brings the sharpest pain, but the true torment comes when that suffering lingers as the weeks turn to months. Those left to mourn Alpha’s examples faced this as a blanketing winter descended on The Walking Dead. A snowstorm provided the first challenge for the renewed union between communities since Alpha established her border. Whisperer-related paranoia and misplaced blame proved hindering, but a new future lies on the other side of the white curtain. After all, no one knows what comes next. 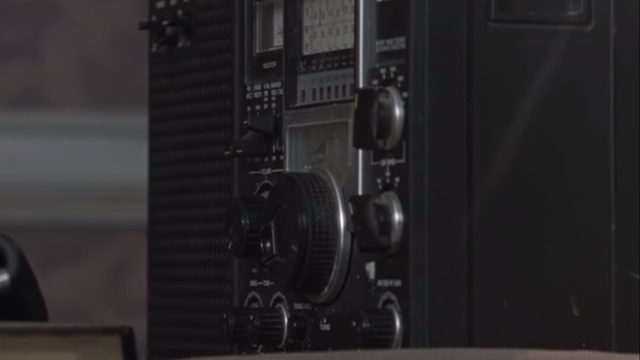 Ezekiel recounts the fall of the Kingdom into a radio. The faulty pipes finally gave out, forcing the residents to abandon their home for the Hilltop. 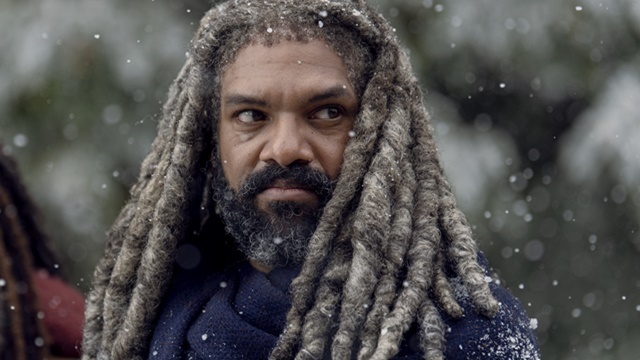 Michonne, Ezekiel, Carol and Daryl lead the convoy through the snow-filled roads. All are confident that the Hilltop will welcome them with open arms despite their leadership being wiped out with Tara’s death. The only one that doesn’t feel confident about the move is Lydia. Daryl sticks up for her even though she doubts the people of Hilltop will accept her after Alpha’s actions. Ezekiel is having his own doubts as a storm approaches. Things with Carol haven’t been the same since Henry’s death and he wants to restore their relationship. He goes so far as to ask Daryl to leave the Hilltop so that Carol won’t have any distractions. The snow storm puts these issues on hold. The group take shelter in the Sanctuary, but there’s no way they’ll survive getting stuck in that husk of a building. They have to press forward, even if the quickest route takes them straight through Whisperer territory. Meanwhile, the residents of Alexandria are struggling with the snow storm as well. All electrical heating devices are on the fritz, forcing the entire community into three homes with sufficient fireplaces. They even free Negan from his cell in order to keep him alive. He rewards their kindness by provoking romantic tensions between Gabriel, Rosita, Siddiq and Eugene. Judith stands by the window looking for Daryl’s dog as the chimney’s lack of ventilation causes a small explosion. Their fireplace is nixed and the citizens must brave the elements to stay warm at Aaron’s house. The group enters the storm only for Judith to run off after hearing Dog bark in the distance. Negan chases after her, injuring his leg, and finds her and Dog together. 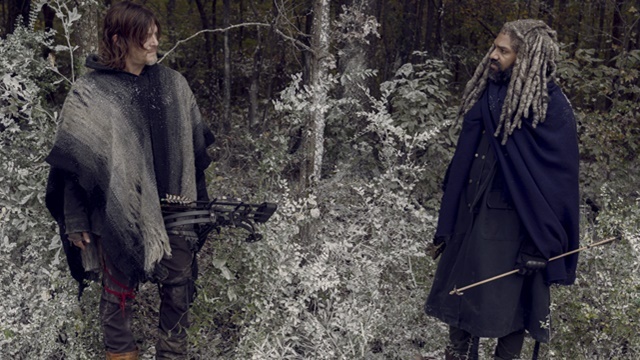 He removes some of his clothing, using it to protect Judith from the cold and carries her back to the group. Dog isn’t far behind. The Kingdom’s residents prepare to cross Alpha’s border, but Lydia splits off from the group. She comes across a walker frozen in the river and offers her arm to the monster. Carol catches her in the act, leading Lydia to back down and rejoin the group. She sneaks away from the group once again while they’re in Whisperer territory. As the others deal with walkers by the river, Carol chases Lydia down. She tries to convince Carol to kill her. No one in any of the communities want her around because she is the reason Henry and so many others are dead. Lydia places Carol’s spear on her chest and asks her to kill her because she’s weak. Carol disagrees. Lydia isn’t weak. Carol pull sher spear away and the two rejoin the group. After braving the storm, walkers, the worry of Whisperers and a frozen river, the group finally reaches the Hilltop. Michonne Daryl and Lydia don’t stick around long. They head back to Alexandria the next morning along with Carol. Henry’s death and the fear of slipping away again forces her to take a break from Ezekiel. She gives him back her wedding ring before leaving with the others. Michonne promptly thanks Negan for saving Judith’s life upon her return. 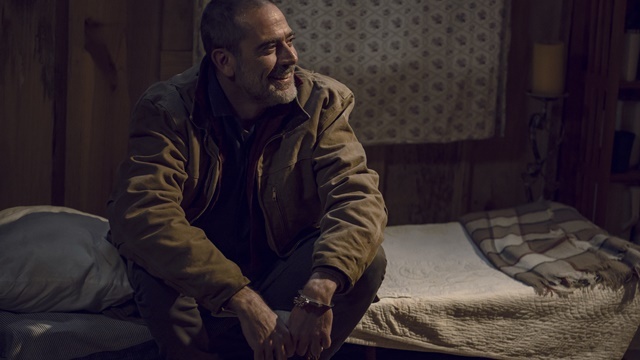 Negan takes the thanks in stride before asking about the Kingdom’s residents. He knows what it’s like to lose a kingdom as well. Michonne takes a jab at the state of the Sanctuary before pridefully restating that they made it. After some time, the harsh winter begins to subside. The melting snow brings Alpha’s followers back to the surface. Their time away was good for Alpha, but she must renew her strength for what’s to come. She does so by extending her arm so Beta can whip her punishingly. What do you think about The Walking Dead season 9 episode 16? Let us know in the comment section below!